We’d love your help. 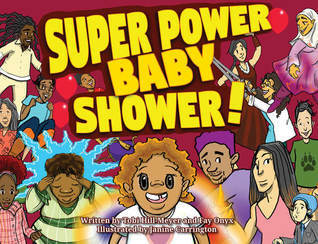 Let us know what’s wrong with this preview of Super Power Baby Shower by Tobi Hill-Meyer. Roark flies, Nova can make fire, and Victoria can talk with her mind. Now, they're also having a baby! At the baby shower, an urgent call comes in to Granny Awesome for help at the wolf sanctuary. The guests fly off to give their assistance and return to a wonderful surprise. To ask other readers questions about Super Power Baby Shower, please sign up. This isn't my favourite of the Flamingo Rampant books: The plot was a little disjointed for me (it's about rescuing wolf cubs that escape from a sanctuary during the baby shower) and the illustrations weren't my style, but it is diverse, including lots of representation of people of different races and abilities, and it does have a kid with three (polyamorous?) parents. It's about a family at a baby shower, and they all have super powers. But there is a typo at the end. Also it said 2 wolves were missing but 3 were found?